This article discusses some tricks for playing Minecraft. The tricks will only work on an original version, not a pirated one. Minecraft is inexpensive and DRM-free. You can keep a portable version of it on your USB key. To run the game without an internet connection, you must have Java installed on your system. 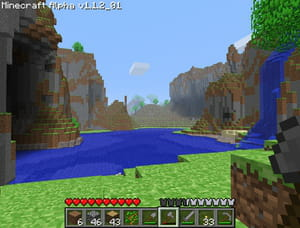 The user is also required to play the game at least once online to enable Minecraft to download the files. It is stated that although the portable use of Java may be possible, this function has not yet been tested. Note: This trick is only valid if you purchased the original Minecraft game. You must have played the game online at least once to enable Minecraft to download its files. Here's how to have a portable version of Minecraft. It will allow you to carry your game on a USB key and you will be able to play without an internet connection. Note that: Java must be installed on the host computers for you to play your game. You must have played the game online at least once for Minecraft to download its files. Your .minecraft directory contains these words, and is located in your user profile (c:\Users\yourlogin\AppData\Roaming\ under Vista, or C:\Documents and Settings\yourlogin\Application Data\ under Windows XP). Then, simply double-click portable_minecraft.bat to play the game! Altering the APPDATA environment variable does not touch the system APPDATA. This change will only affect programmes launched from the bat file. It will not change your system settings. Minecraft makes a lot of disk writes, which may be slow on USB keys. The game may freeze from time to time. For a better performance, unzip to HD, play on HD, then zip back to USB. It may be possible to use Portable Java, but this has not been tested. Several versions have been added to the game. A Survival mode has been added and an Adventure mode is in the process of being added. Those who have already bought the game can access the in-development version known as Beta. Published by jak58. Latest update on June 26, 2012 at 04:07 PM by Jean-François Pillou. This document, titled "Portable Minecraft (Minecraft on your USB key)," is available under the Creative Commons license. Any copy, reuse, or modification of the content should be sufficiently credited to CCM (https://ccm.net/).